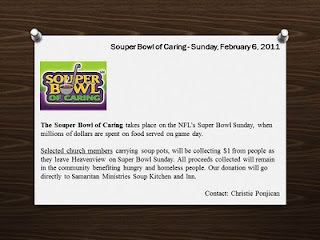 Serving Our Generation: Heavenview participated in Souper Bowl of Caring! We raised $158 for Samaritan Ministries Food Kitchen and Inn on Super Bowl Sunday! Thank you, Heavenview, for making a difference in Winston-Salem.